Hey friends! So I'm back with more nail art! I kinda feel like even tho I have been doing art ya'll haven't seen much lately. 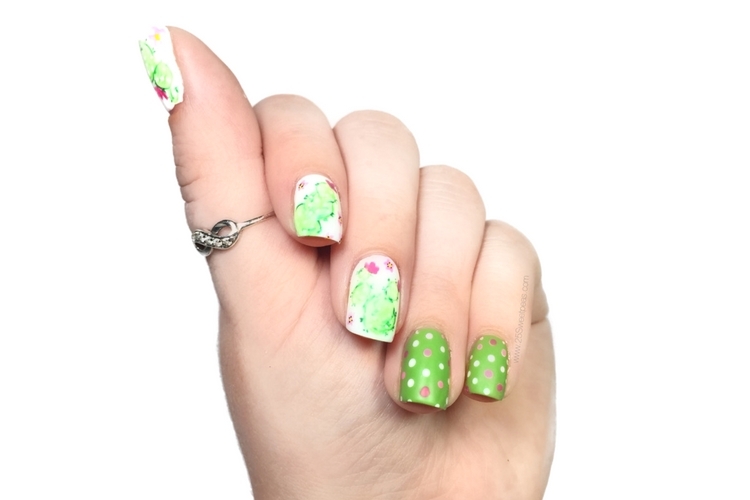 So after going my summer manis I was then super in the mood to do more cacti nails so for something different I have some watercolor cacti nails to share today! For this mani the polishes area all Serendipity Nail Polish. I love Serendipity Nail Polish and I want to still use them but I also hate the fact I'm going to be showing off these great polishes and then having to tell you that you can't get them any more. Its such a bummer Serendipity is no longer... sigh That all being said I will try to not use it as much but its really hard. Like todays manis, both were quick one coaters that I knew I could count on. Plus I mean the colors are perfect! Anyone else out there feeling this way? Any polished you guys want to see more of? So for this look on the cacti nails I just started with white polish. After that was dry I went in with some light green acrylic paint watered down and created the cacti shapes. While that dried down I went on to my green nails and dotted all of the dots in white. After that I went back to my cacti nails and added in some darker green around the edged and added in the spikeys. Following that was the flowers, which I just used 2 different pinks for. Then I used those 2 pinks and randomly dotted some of the white dots with the pinks. After that I then went back to the cacti and put some white dots on the green to give more of a complete look! Then I topped with a shiny top coat which made the design super hard to see in pictures so I went to matte top coat! Hence why it varied in the pictures. ;) Well that is it! I hope you have enjoyed this post, this look and I hope you are having a GREAT day! I will talk to ya'll soon!